I regularly babysit a 3 (almost 4) year old who has Autism. He does not speak, and he doesn't yet have a reliable alternative form of communication like signing or AAC, though he probably will soon. I have a lot of friends and two cousins who have Autism, but they all speak or sign. I find it difficult sometimes to understand what the kiddo in question is thinking, or wants, and I wondered if you or any of your followers have any first hand tips or advice on how I could better understand him? I know everyone is different, and I'm learning to read things like his body language, but I wondered if you/any of your followers who don't speak or spoke later than most remember anything that helped them get across what they meant when they were younger, or things adults did that were especially helpful. He doesn't have the coordination to sign or draw what he wants yet, being so little. I want to help him feel less frustrated and to be as good a babysitter as I can be. For the sake of readability, I’m going to call your cousin Anthony in this post. The first thing I’d say is: Listening to Anthony matters whether or not you succeed in understanding him. You may not be able to figure out what he is thinking, he may not yet be able to tell you — but you *can* treat him as a person who has thoughts and feelings worth listening to. That matters in and of itself, and it also makes successful communication much more likely. Learning to communicate is really hard, even for typically developing kids. (Which is a reason why two year olds have so many tantrums, and why older kids usually grow out of that.) In early childhood education, a lot of what kids learn is that it’s possible to communicate in ways that others can understand — and that words are usually a better option than freaking out. One of the main ways early childhood educators teach kids these skills is by listening to them, and by supporting them in understanding the feelings they’re having. Kids with communication disabilities have more trouble learning to communicate in ways that others can understand — and they also often have more trouble learning that communication is even possible. Disabled kids need *more* exposure to adults who want to listen to them, and *more* support in understanding their feelings — but they often get less of both. Their feelings are often ignored, and their communication is often treated as nonexistent. All too often, kids with disabilities learn young that no one wants to listen to them. They often try their best to communicate, only to have their attempts interpreted as random meaningless noise or deviant misbehavior. When nobody listens, it becomes really hard to keep trying. One of the best things you can do for Anthony right now is help him not to give up. “I don’t understand you yet, but I’m listening”. “I’m not sure what you mean, but I do care”. It doesn’t go without saying — and sometimes saying it makes a big difference! Does he point at things? Lead you to things? Flap differently under some circumstances? Make a guess about what you think he might mean, and act on it. “I think you want the book because you’re looking at the book. I am getting the book”. He can’t read your mind, so it might not be obvious to him that you’re acting on what you think he’s doing — so tell him! Even if he can’t respond, being asked matters — it shows him that you care what he thinks, and that there’s a reason to try to communicate. He might be more able to tell you which shirt he wants if you’re holding both of them. Or if you’re holding one in one hand and one in the other. Or if you put them down in front of him. Eg: “You pointed to the dragon book, so we’ll read the dragon book”. Or it may make more sense to just start reading it. Sometimes that works better than inserting too many words. Eg: “Ok, we’ll go to the park”. Again, even if he can’t respond in a way you understand, trying matters. Pointing doesn’t require motor skills on the same level that writing and drawing do. Again, in the two book example, you can ask him to point to the one he wants. Take two books, and say “I choose the dragon book”, point to it, then read it. Remember that words can be communication even when they’re unusual: A lot of autistic people use idiosyncratic language to refer to things, or repeat phrases they heard somewhere else – in a way that they may or may not mean literally. Here’s a method for noticing when repetition is communication , and some thoughts on listening to folks whose speech is unusual. The standard teaching advice is: When you ask a question, wait at least seven seconds before you say anything else. This feels a little unnatural — it can feel like a *very* awkward pause, and it can be tempting to jump in and say more stuff to clarify. But if you say more stuff to someone who is thinking and formulating their answer, it tends to just give them *more* stuff to process. So give him time to respond — and be aware that autistic people often need longer to process and respond. If you have an iPad you’re willing to let him play with, iPad use can really help some kids with motor skills and learning communicative cause-and-effect. Most kids learn pretty quickly how to scroll through select the app they want, and that skill often transfers. You can also try the Toca Boca apps — a lot of kids like those, and some, like Toca Hair Salon, don’t require particularly strong motor skills. Often, the best way is to play with the app together — eg, you show them how to drag the letters around, then offer them a turn. Or help them out when they get stuck, without taking over. Or say things like “which color should we pick? How about purple?” and see how they react. Everything in this post still applies once he gets a device or a system. An AAC device is just a tool. It’s one mode of communication, which might be useful for him under some circumstances. Having an AAC device will not make him instantaneously able to communicate using words in the way that typically-developing kids his age do. While some people learn to use an AAC device fluently very quickly, that is rare. Most people who use AAC because of a childhood speech delay take a long time to learn it. And in any case, giving someone a tool doesn’t cure their disability. An AAC user with a communication disability still has a communication disability, and disabilities that interfere with speech sometimes also interfere with language. Even people *without* language disabilities tend to take a while to learn, for all the same reasons that typically-developing kids take a while to learn how to use words to express themselves. Communication takes practice. AAC implementations can also end up treating AAC use as an end in itself and forget that the point is to support communication. For most AAC users, AAC is one communication mode among many they use, and it’s not always the best one in every situation — eg: pointing to a banana can be a *much* more efficient way to communicate than scrolling through a device and finding the “I” “want” and “banana” buttons. If Anthony gets an AAC system, he will still need you to put effort into listening to him, and he will still need you to take all of his communication seriously. Don’t ignore his communication in order to force him to talk or use a system. The best way to encourage communication is to listen! He’s not struggling to communicate because he’s lazy; he’s struggling to communicate because he has a disability. He’s doing something really hard, and he’s in a hard situation, and that needs to be respected and supported. You don’t need to introduce artificial difficulty; he is already experiencing more than his share of the real kind. Anyone else want to weigh in? What is helpful for effective communication with a nonspeaking four year old? You can answer using my contact form. Tl;dr If you’re babysitting a kid who has trouble with communication, the most important thing you can do is listen to them. Scroll up for some specific options. 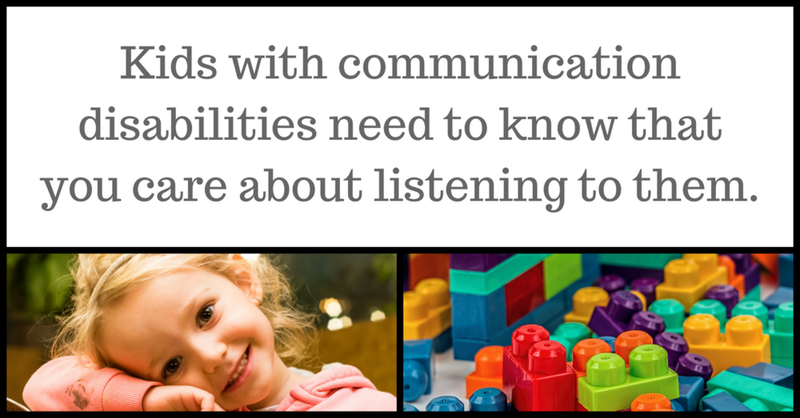 Image description: Text "Kids with communication disabilities need to know that you care about listening to them", next to a picture of a young child and a picture of some plastic duplo-style building blocks. Newer PostYou can be autistic and have a sexual orientation at the same time. Older PostWhat topics would you like to see me write about?